This is a small format (10mm x 10mm x 4mm) vitreous glass mosaic tile in Lightest Blue. Supplied face down on a paper sheet ('paper bonded') there are 841 individual tiles per sheet. The tiles can be easily separated by soaking in warm water for 5 - 10 minutes, after which the tiles will slide off the paper. The back of every tile is ridged to aid adhesion. These tiles are ideal for art and craft purposes. They can be used alongside the larger 2cm mosaic tiles and are particularly useful for lettering or detailed areas in larger mosaics, or by themselves in smaller mosaics. Great for younger children (6 and above) as an alternative to using split tiles. Always take care to ensure that children are well supervised when using mosaics as they could be swallowed and there can be tiny, almost invisible, shards of glass produced when glass tiles are split. 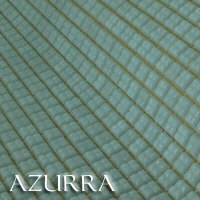 Part of the Azurra Craft Mini range, there are 841 individual Lightest Blue 10mm x 10mm x 4mm vitreous glass tiles on each sheet. Each sheet covers an area of approximately 0.101 square metres / 1.09 sq ft, though the tiles are typically applied individually so will cover a much larger area.